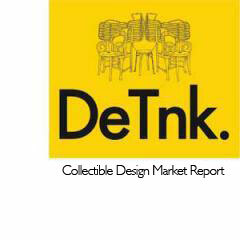 We are delighted to announce the launch of the 4th DeTnk Collectible Design Market Report, a holistic analysis of the emerging collectible design market sales during 2013. The basis of the Market Report is sales data from the past 8 years from five of the world’s largest auction houses. Some key findings of the report include details of the average yearly market growth and the varying regional impact of the design market. The report also includes the DeTnk Design Index which takes into account the total value of sales and percentage bought-in at auction to summarise a massive quantity of data into one simple number; providing a reference to the market’s climate and allowing one to compare the market between years. account the value and volume of sales per designer and ranks the Top 100 for the year 2013. From the Top 100, a selection of designers have been further analysed to gain insight into the mechanics of the market. Please select "Historical Report" to receive all past DeTnk Collectible Design Market Reports - or 2014 report to only receive the 2014 report.